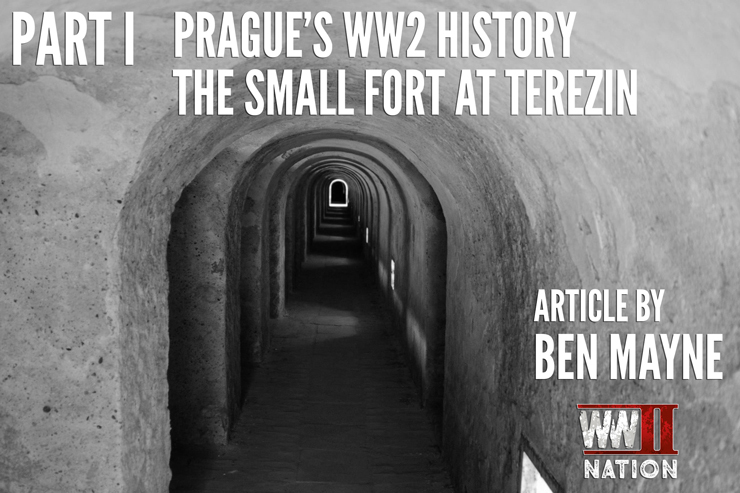 In a 3 Part Article Series, we take a small glimpse into Prague’s Second World War related history with battlefield guide, Ben Mayne, who recently returned from a trip visiting the Czech Republic and a few sites connected with this period of history. As some of you may know who follow me on Twitter and Facebook, I’ve recently returned from a four day trip to Prague within the Czech Republic. This had been planned for around six months and at first I thought this would just be a city break, it soon turned out to be far from just a walk around a city looking at historic architecture! I have to be honest and say I had very limited knowledge on the Czech Republic and their efforts during the war. Some prior research before heading out had opened up my eyes to a vast amount of history that I wasn’t fully aware of. I’d seen the film ‘Operation Daybreak’, but not thought to look into the details around it until this trip was organised. I was kindly loaned a book, ‘The mirror caught the sun- Operation Anthropoid 1942’ written by John Martin. This book, which I thoroughly recommend reading before visiting Prague became my guidebook whilst walking the streets. Without it, I think I would have missed an awful lot of poignant locations. 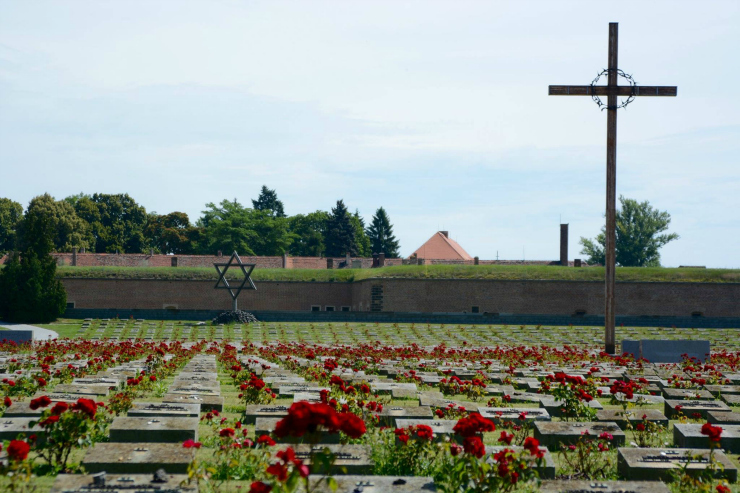 The four days would see me take in the Terezin Concentration Camp, the Czech resistance operations and the Battle within Prague against the Nazi’s, the uprising and Communism that would come upon the liberation by the Russians. 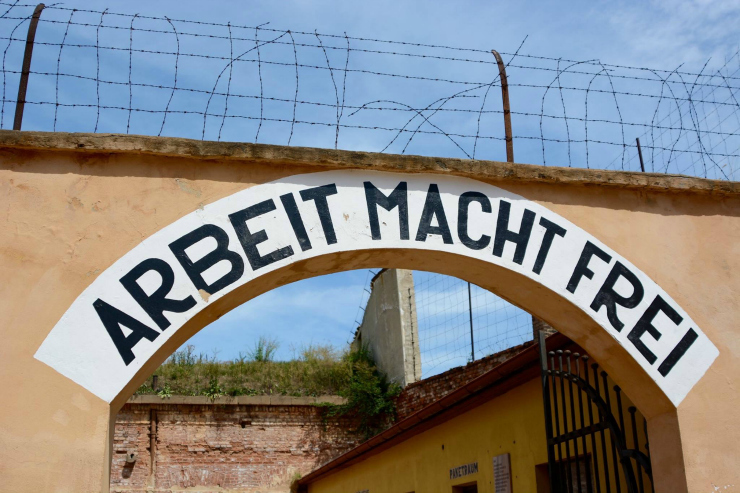 The first tour I would go on was to visit the Concentration Camp at Terezin or as it is also known as, Theresienstadt. This would be my first visit to a location that was linked to the Holocaust, and I wondered how I would feel about seeing what lay ahead of me during this day. The tour was broken down into two parts. The first stop was to a small fort that was used as a prison for holding not only Jews but political prisoners and people of other religions who opposed the Nazi occupation. The second stop was to the town itself which was a large fort where the Jewish community were held within the walls in the ghetto; it was here that the true horrors really hit me. As we stopped outside the small fort, immediately you are reminded of why you are on this tour with a large cemetery, the graves overlooked by a large cross in the centre and at the rear the Star of David. This was different to visiting a cemetery of fallen soldiers; this was a cemetery of people who had suffered brutality and murder. They were here because they spoke out against oppression or simply followed a religion that did not conform to someone’s beliefs. A very hard hitting introduction, and one of many lasting memories from this trip. 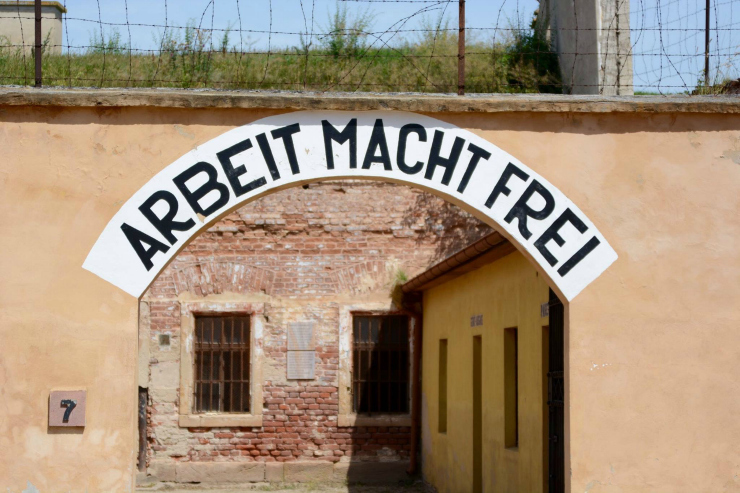 Once inside the small fort, you are soon confronted by the sign, ‘Arbeit macht frei’, Work sets you Free. A chilling sight to stand and observe knowing this was far from the case. It makes you stop and think about the people who saw this sign and held on to a small glimpse of hope that this may be true. Sadly history shows that this was not the case for millions of people. We started to look at the living conditions that were given to the prisoners. 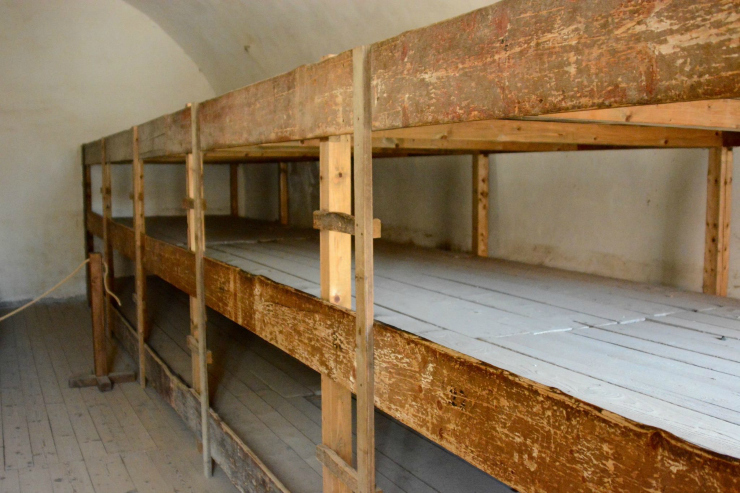 I walked into a room to find the large wooden framed beds that have been captured in so many images of concentration camps. These were clearly not built for comfort and it is easy to see why illness and disease would easily spread between people being in such a small space with a large number of other people. We spoke of the food that was offered and I was not surprised to learn that when making bread for the prisoners, mixed in the flour to pad out the ingredients they would add sawdust and leftover pharmaceutical products. Inside the rooms it is was very cool, outside the temperature was in the high 20’s and sunny. 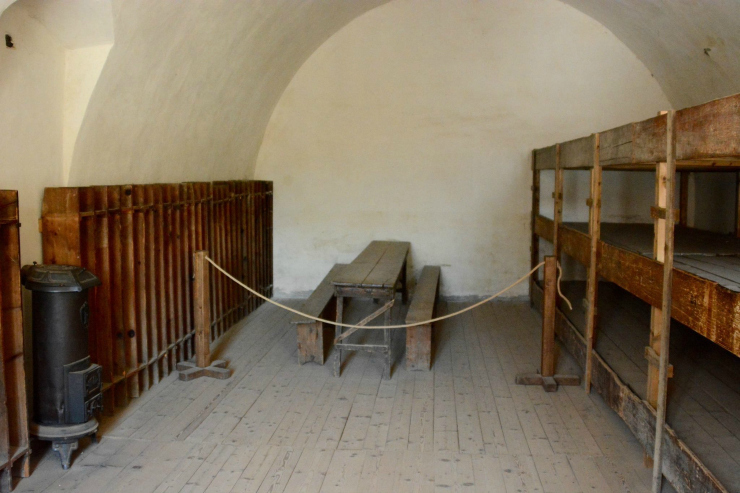 I thought in the winter it would have been unbearably cold for the prisoners but also in the warmer months, it would get too hot with multiple people being held in the room with little or no ventilation. 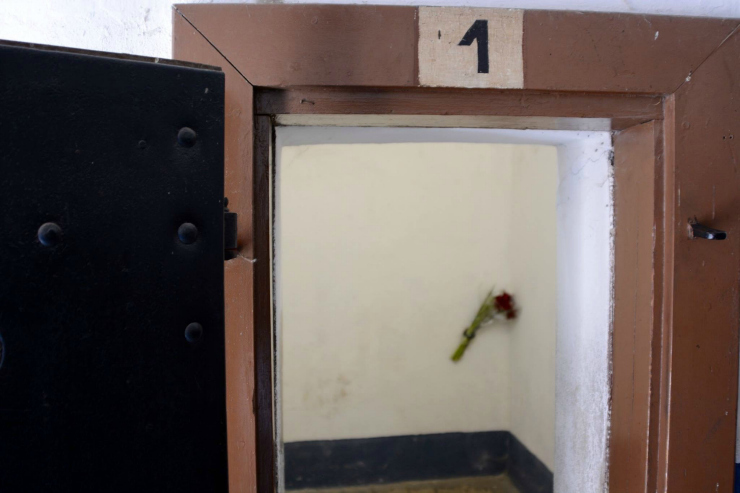 We moved on to a cell block which during 1914-1918, cell number 1 housed Gavrilo Princip. Princip was held here by the Austrian-Hungarians during the First World War after his conviction for the assignation of the Archduke Franz Ferdinand and his wife. Princip eventually died within cell 1 of tuberculosis. From the cell block we then took a walk for around ten minutes using the tunnel network that had been built into the fort. For those of you who have experienced walking the tunnels of the First World War in Europe on the Western Front, this had a similar feeling. 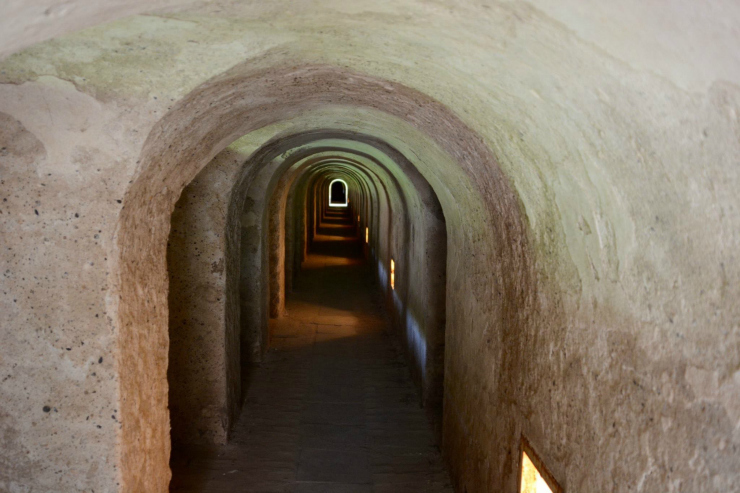 The difference with this, was this tunnel lead to an area of the fort which prisoners would not return from, as such this would have been their final walk. We exited from the tunnels in to a courtyard containing a firing wall and gallows. A small bouquet of flowers lay in front of the grassed bank and wall. As brutal as it sounds this was an execution yard. I took a moment to pause and reflect which I did several times throughout this day. I stood in silence and could only hear the singing of birds that were flying around the fort and nesting within the walls, peaceful but masking a dark past. 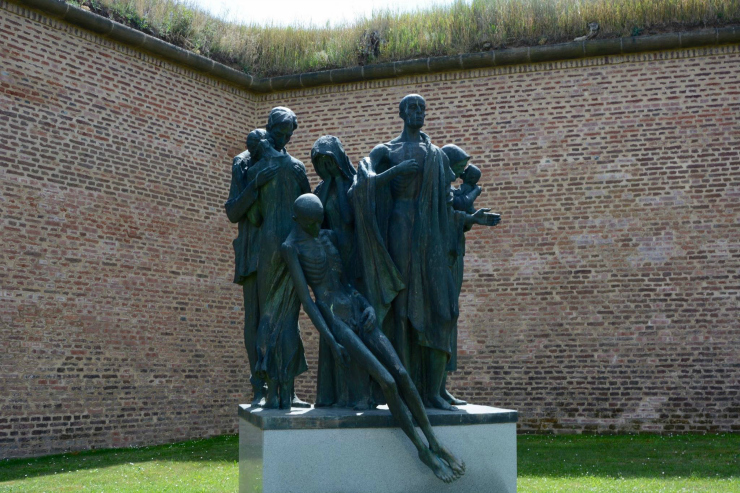 Just outside this courtyard was a memorial to the former inmates of the camp, this was very graphic and made sure that anybody who looked at it was left in no uncertain terms or doubts of what a dark history this location had. 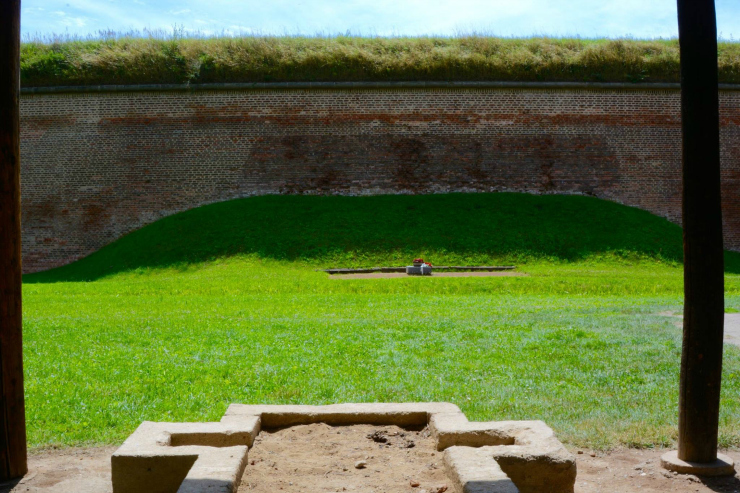 I had the chance to walk around for a short time before we were to head off to the large fort of Terezin. The small fort of Terezin by the end of the Second World War had processed around 35,000 prisoners, I am unsure of the figure for how many of them survived but in reality, most, if they made it out of the prison would end up in the large fort, to then end up dying there, or being transported to further camps resulting in extermination. Thank you to Ben for sharing with us his experience of the Fort at Terezin, it must have been an incredibly emotive and moving experience, very hard to truly fully summarise and put it all into words. Until then, why not listen our latest interview on the Veterans Podcast Archive with former WW2 Tank Commander, Captain David Render. Photo Credits: All photos were kindly taken and provided with permission to use here by Ben Mayne.